A young tattooed traveller has found himself facing the wrath of members of a Hindu community in India. 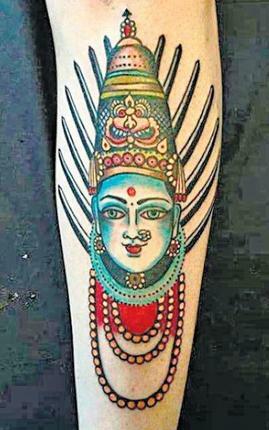 Matthew Gordon offended the Hindu’s with his tattoo of the Hindu goddess, Yellama. Gordon and his girlfriend Emily were surrounded by an angry mob outside a restaurant. They were later taken to the local police station and Matthew claims it was here police officers again accused him of insulting Hindu’s and their beliefs. A tattoo of Yellama, a Hindu Goddess. Kelly Dargan, who has experienced many countries on her travels and has actually worked in India for 12 months, was not surprised. “It’s one of the more conservative countries I’ve been to, especially the rural areas and when you get away from the tourist hotspots. So when I heard this I thought to myself; what an idiot,” she said. Gordon has claimed he was with his girlfriend at the time of the incident and those who confronted him had even threatened to skin his leg to remove the tattoo. Dargan doesn’t believe it is the local populations fault for their reaction in regards to finding the tattoo offensive, but that they might have gone too far with the way they reacted. “Australians can have a bad reputation as travellers. I think sometimes we are a little inconsiderate of other countries and their people’s customs and beliefs. You just have to be a bit more mindful and aware of the community you are experiencing and its culture. That’s why we travel really anyway”. Those who are planning on travelling overseas are encouraged to visit the smartraveller.gov.au website to get an insight and understanding of what is accepted and expected in those countries they plan on visiting before getting there. The site is a government initiative set up to ensure that Aussie travellers don’t find themselves in a situation like that of Gordon and his girlfriend Emily found themselves in in India.